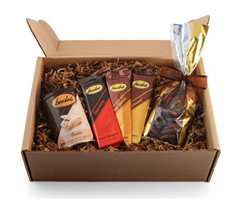 Bedré Fine Chocolate launches subscription box in time for holidays. Bedré Fine Chocolate today expanded its product line with an introduction of a subscription-based program. Officials with the Oklahoma-based gourmet chocolate company today announced Bedré Box, a bi-monthly subscription box delivering an assortment of its products to doorsteps across the nation. Kay Colbert, Bedré Fine Chocolate general manager, said that Bedré Box is the Native American tribe’s entry into the growing market for subscription boxes that arrive regularly but contain certain products that may be available for a limited time or give subscribers the opportunity to test potential new products. Colbert said that Bedré will take orders for the initial Bedré Box installment through Dec. 7 and will ship beginning Dec. 14. The first box will include a milk chocolate peanut butter bar, a dark chocolate raspberry bar, a milk chocolate caramel bar, a can of Twists and two handmade items – milk and dark chocolate salted caramel discs. Bedré Box is $39.95 per box, which includes shipping costs, and will be delivered six times a year: February, April, June, August, October and December. To place an order, subscribers can call Bedré Fine Chocolate’s customer service line from 8 a.m. to 5 p.m. Monday through Friday at (800) 367-5390. More information about Bedré Box can be found at bedrechocolates.com. To download photos and a Microsoft Word version of this release, click here. Owned and operated by the Chickasaw Nation, Bedré Fine Chocolate has set the standard for quality gourmet chocolates. The production facility in Davis, Oklahoma, utilizes state-of-the-art machinery to ensure the ingredient mix is controlled, guaranteeing a superior and more consistent product. Bedré is a Norwegian word and simply means "better.” The name truly conveys the vision of the company. Bedré is made from only the finest ingredients. The recipes are tried and true, offering a soothing and satisfying experience to the most distinguished palate. With more than 60,000 citizens, the Chickasaw Nation is the 12th largest federally-recognized Indian tribe in the United States. The Chickasaw Nation has an annual economic impact of more than $2.4 billion in Oklahoma. The tribe has nearly 14,000 employees. A democratic republic with executive, legislative and judicial departments, the tribe's jurisdictional territory includes all or part of 13 counties in south-central Oklahoma.